ADHD in Adults Valid Diagnosis and Treatment Strategies? This Clinician Guide was developed to assist primary care physicians, pediatricians, and other clinicians in the diagnosis and treatment of ADHD in children and adolescents. The KP National ADHD Guideline primarily adapted the 2011 recommendations developed by the National Institute for Health and Care Excellence (Attention Deficit Hyperactivity Disorder: The NICE Guideline on Diagnosis and Management of ADHD in Children, Young People and Adults) and Scottish Intercollegiate Guidelines Network (Management of Attention Deficit and Hyperkinetic Disorders in Children and Young People) with modifications. It is not intended or designed as a substitute for the reasonable exercise of independent clinical judgment by practitioners. All children and adolescents should receive sufficient exercise (at least 1 hour daily), a balanced and healthy diet, and limited electronic and television time each day. Do not offer universal ADHD screening to children and adolescents. Evaluate children and adolescents for ADHD when they have signs, symptoms, or impairment suggestive of ADHD. As part of the evaluation and diagnosis of ADHD in children and adolescents, use structured and validated rating scales1 and refer to and follow the DSM-5 diagnostic criteria. Before initiating pharmacological therapy in children and adolescents with ADHD, conduct a baseline physical assessment, including measurement of pulse, blood pressure, weight, and height with the appropriate use of percentile charts. 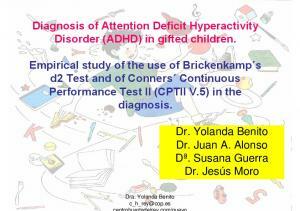 Do not perform psychodiagnostic tests as part of ADHD evaluation in the absence of other indications. For children and adolescents diagnosed with ADHD (with or without comorbid conditions), recommend stimulant medications methylphenidate, amphetamine mixed salts, or dextroamphetamine as first-line pharmacological treatment. Collaborate with patients, parents and/or caregivers to select first-line pharmacological treatment based on preferences, side effects and potential harms, pharmacokinetics (rapidity of onset, duration of action), cost, and formulary availability. Provide instructions to patients, parents, and/or other caregivers about cardiovascular signs and symptoms (for any stimulant), or liver dysfunction, and suicidality (for atomoxetine). Patients, parents or caregivers should seek medical attention should any of these signs and symptoms occur. Start, initiate, prescribe, treat, etc. Provide the intervention. Most individuals should receive the intervention; only a small proportion will not want the intervention. Assist each patient in making a management decision consistent with personal values and preferences. The majority of individuals in this situation will want the intervention, but many will not. Different choices will be appropriate for different patients. Assist each patient in making a management decision consistent with personal values and preferences. The majority of individuals in this situation will not want the intervention, but many will. Different choices will be appropriate for different patients. Stop, do not start, etc. Do not provide the intervention. Most individuals should not receive the intervention; only a small proportion will want the intervention. *Refers to the extent to which one can be confident that the desirable effects of an intervention outweigh its undesirable effects. This guideline is informational only. It is not intended or designed as a substitute for the reasonable exercise of independent clinical judgment by practitioners, considering each patient’s needs on an individual basis. Guideline recommendations apply to populations of patients. Clinical judgment is necessary to design treatment plans for individual patients. The publicly available Vanderbilt ADHD Rating Scales are recommended as part of the evaluation and diagnosis of ADHD in children and adolescents. The following behavioral rating scales can be used in addition to the initial evaluation: Conners’ Rating Scales (revised Conners’ Parent Rating Scale [CPRS-R], revised Conners’ Teacher Rating Scale [CTRS-R], and Conners’-Wells’ Adolescent Self-Report of Symptoms scale [CASS]); Achenbach Scales (CBCL, TRF, YSR); ADHD Rating Scale – IV (ADHD RS-IV, DSM-5 based); and Swan, Nolan, and Pelham Questionnaire (SNAP, DSM-5 based). Achenbach and Vanderbilt behavioral rating scales can be used to assess some comorbid disorders. 2 Examples of clinic-based non-drug interventions are CBT, family therapy, and parent and social skills training. 3 Elimination diets were introduced with the ‘Feingold theory’ and implicated artificial colorings, preservatives, and cross-reacting natural salicylates in a variety of illnesses, including ADHD (BF Feingold, Why Your Child is Hyperactive, 1974). Report "Diagnosis and Treatment of ADHD in Children and Adolescents Clinician Guide MARCH 2016"